I have just received these two books as purchased from Amazon UK. 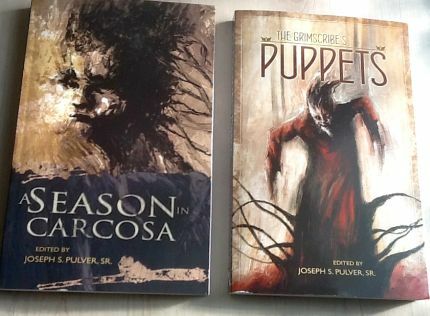 A SEASON IN CARCOSA – THE GRIMSCRIBE’S PUPPETS : edited by Joseph S. Pulver Sr. Stories by Eddie M. Angerhuber, Laird Barron, Allyson Bird, Michael Cisco, Nicole Cushing, Gemma Files, Cate Gardner, Richard Gavin, Cody Goodfellow, Michael Griffin, Pearce Hansen, Michael Kelly, Joel Lane, John Langan, Livia Llewellyn, Richard A. Lupoff, Gary McMahon, Daniel Mills, Edward Morris, Scott Nicolay, Jon Padgett, Kristin Prevallet, Robert M. Price, Joseph S. Pulver Sr., Ann K. Schwader, Darrell Schweitzer, Robin Spriggs, Simon Strantzas, Anna Tambour, Jeffrey Thomas, Paul Tremblay, Kaaron Warren, Don Webb. Links above are to my reviews. In the comment stream below, I hope eventually to conduct a gestalt real-time review – by surname alphabetical order of authors.